Stradivarius wins the 2018 Qatar Goodwood Cup! Stradivarius took another big stride towards the season's leading stayer award - and an unrelated £1m bonus - when landing today's £500,000 G1 Qatar Goodwood Cup over two miles. Gaining his third win of the season, the John Gosden-trained four-year-old repeated his win in the race of last year, and was again ridden by Andrea Atzeni, standing in for suspended Frankie Dettori. Stradivarius wore down his market rival, pace-setting Torcedor, to win by half a length, although he looked capable of extending that advantage had it been his jockey's choosing. Gosden said of the Bjorn Nielsen-owned-and-bred Stradivarius: "We had a great horse race on Saturday in the King George, and another great horse race today - two really brave horses who both had a tough race at Royal Ascot [in the Gold Cup]. Colm [O'Donoghue, who rode Torcedor] rode a clever race in front today and did everything right, but our horse battled hard. 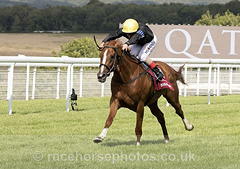 "The pace was a little stop-go, which you would expect at Goodwood when someone is in front and making the running to suit themselves, and to that extent we had work to do to get past him. With the Aga Khan's horse [Vazirabad] not coming for this race, and Order Of St George absent too, Torcedor became the obvious danger, and when Jessie [Harrington] left him in at the six-day stage I thought 'Oh, oh, we're in for a battle', but it proved to produce a fabulous race. "It wasn't quite the test of Ascot [where Stradivarius won the Gold Cup over an additional half a mile] but he got the job done. This is not a track where you want to give a rival too much rope, but all's well that ends well. Congratulations to the second for making it such a fantastic race. "They have long criticised chesnut horses with four white socks and a white face, or at least they did until The Minstrel came along in the 1970s and won Derbys and King Georges, and this horse is the same. He has a lot of heart and Andrea said he had the race under control in the last half a furlong. "I've just ticked him over since Royal Ascot. He's the most charming horse to be around - a real gentleman. He's a little bit like a motorbike; he can go out there and do a little bit on his own or a bit in company. You press the button and off he goes, you flick the switch and he pulls up. He's a lovely ride." Stradivarius now stands on the cusp of winning the WH Stayers' Million, a bonus put up by Weatherbys Hamilton Insurance and designed to encourage the breeding, buying and racing of staying horses. Nielsen's homebred has now won three of the required four legs, and needs to land York's G2 Lonsdale Cup next month to secure the payout. Gosden said: "The Lonsdale Cup is the next stop and we'll have to do everything we can to try and win it. We have three and a half weeks which should be all right. Andrea did not give the horse a hard race today because he was thinking ahead - which was nice of him, and Frankie will be grateful! - and we know horses have to be in top order for such a test." Stradivarius has an entry in the Prix de l'Arc de Triomphe in October, and Gosden said: "You have to make a plan for the autumn. Do you go for the Melbourne Cup, carry top-weight and find yourself giving the guts of a stone to a three-year-old in November, which is tough, or do you go for the Arc which is a massively difficult task? In the Arc you need tactical speed, agility and luck, so I think we will get past York first before thinking about huge fences like that." Newmarket-based Gosden has now won three Qatar Goodwood Cups, twice with Stradivarius and also with Sonus, who scored under the late Pat Eddery in 1993. Gosden said: "I'm very pro the staying races and I like everything they have done to promote fillies' and mares' races, including upgrading the [G2] Lillie Langtry Stakes here on Thursday. I'm terrified of racing becoming one-dimensional, for instance one turn and six furlongs, and while I love sprinters you don't want to watch eight sprints a day. You need these long races, and I noticed during the Gold Cup how much the public loved the race, and witnessing the spectacle of horses going past the grandstand and out into the back straight. There was so much shouting and cheering. "We understand the commercial world needs a certain amount of precocity and speed, but I think it's gone too far that way, and the owner/breeder that produces horses like this is now a rare species. We're trying to bring that back." The Goodwood Cup was first run in 1808, and it was won on three separate occasions by Bucephalus. Its trophy, a silver cup, was awarded permanently to the horse's owner after the third victory. The replacement trophy was a gold cup, and the inaugural running for this took place in 1812. The race was originally contested over 3 miles, but it was later cut to 2 miles and 5 furlongs. A number of foreign-bred horses won the Goodwood Cup in the mid-19th century. Early winners for France included Jouvence, Monarque and Flageolet, and the United States was represented by Starke. A notable overseas victory came from Kincsem, a Hungarian filly undefeated in a career of fifty-four races. The present system of race grading was introduced in 1971, and the Goodwood Cup was initially classed at Group 2 level. It was relegated to Group 3 status in 1985. It was shortened by a furlong in 1990, and reduced to its current length the following year. It regained Group 2 status in 1995 and upgraded to Group One status in 2017. The Goodwood Cup is one of Britain's leading events for "stayers" – horses which specialise in racing over long distances. It is the second leg of the Stayers' Triple Crown, preceded by the Gold Cup and followed by the Doncaster Cup.